“I have been working with Chris as my Coach for several years now. In the beginning as I was just learning how to race, Chris was an excellent coach in terms of helping me understand the training prescribed for me. He continues to this day, to make me think about what it is I would like to accomplish in my race season, and he structures and tailors my workouts according to those goals. “Chris and I met 5 years ago over the telephone. I live in Kleinburg, a small village on the outskirts of Toronto. I had heard about Chris through a few friends and wondered if he'd be able to take my cycling to the next level without having to go to London. Not only did he train me, but he did it well. Chris arranged for all my testing to occur near my home. He analyzed my data and kept on top of my training through Strava. He developed personalized programs that fit my competition goals. When he could see I was overtraining, he would tell me. No matter how I felt, he always had me in perfect condition for race day. I still haven't met Chris face to face after all this time, but I wouldn't cycle the way I do without him in my corner. 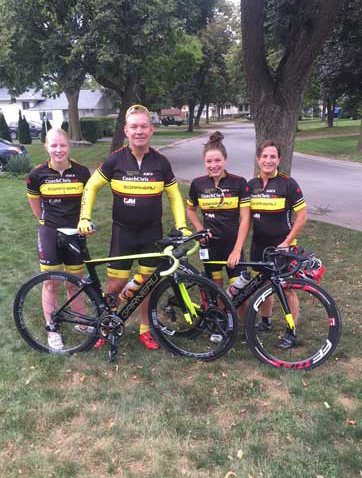 “In the fall of 2014, Triathlon Ontario recommended Chris as a potential source for a cycling Coach. Since that time I have been fortunate to train with and learn from Coach Chris. Ranging from long distance fall rides where I learned about his countless travel and racing experience, to numerous intense winter indoor trainer sessions he has helped me develop the speed, power and bike handling skills that I need to become faster and more confident. He has taken me from being a junior triathlete with little cycling experience, to one that had the fastest bike split in the 16-19 age group at the 2016 Triathlon World Championships in Cozumel Mexico. This past winter, I made some coaching changes with running, and am now running along side Chris as well. Since then I have found that my times have improved, my technique has bettered, and overall I learned to love running again. Not only is Chris an amazing Triathlon Coach, he has designed a strength program for me to do a couple times a week, specialized to what a young triathlete needs to focus on. Chris is more than willing to help me balance my triathlon training with my commitments at school maintaining the balance needed for a student athlete. “I’ve been Competitively racing my mountain bike for 15 years. I started off with a local race series, and got involved in team 8 and 24 hr races. I had some reasonable results locally, and some good results at the relay races (in 4 or more person teams ), but had a quick reality check when I tried out the Ontario cup Mountain bike race series. It turns out that local success didn’t equate to being quick at the provincial level. I ventured into endurance races, and stage races. I’ve competed in Transrockies and Crank the shield, two times. All of the above, I did with no formal training. Just a guy going out and riding his bike, with no idea what I was doing. While competing at some of the O-cups, I saw some Coach Chris jerseys going past me during races. In mid 2012 I decided that I wanted to be more than a Mid pack rider, and find my way to closer to the podium. 2013 had me finishing O-cup races in the top 10, and my buddies from my relay races noticing my faster lap times. My recent 2017 race season saw me Finish 4th overall in the MTB O-Cup race series, and 3rd at Provincials, along with a bunch of relay race podiums. While the improvements in performance are huge motivators to stay on with Chris, the thing that impresses me with Chris is his compassion for his athlete’s. In the past 2 years, I’ve had 2 major injuries that affected my ability to ride and train. Chris was very accommodating and helpful during this very trying time for me. It was hard for me not to be able to perform the way I’ve come to know I can, and Chris helped to keep my frustration inline, and kept me from going to hard, too early. "In the past 6 years, Chris has taken me from a guy with a desk job who wanted to be a Triathlete, to riding the complete route of the 2010 Tour de France one day ahead of the pros. No matter how large my goals and dreams Chris has been there every step of the way. From his complete knowledge of training through perceived effort, heart rate training and training with power, Chris is also there for me on the bike and at the tours ensuring that I get the most out of the specific training programs he has designed for me. I'm impressed and grateful that through Chris' structure and experience he was able to prepare me specifically for each event. Whether it was a sprint triathlon, the World Duathlons, or a 3640 km trek through France Chris had me dialed in just right!" "Working with Chris has been a very positive experience. I have found in him everything I was hoping for in a coach, and as a "novice" cyclist I am surprised by how far I have come with Chris in a relatively short amount of time. I am impressed with the care and thought that is put into developing a complete personalized program and by his knowledge of the science of cycling. Working with Chris has allowed me to maximize the use of my time and taken the guess work out of my cycling — when I go out the door for a ride, I am confident I am doing " the right thing" and taking steps towards my goals. With Chris to guide me through the off-season this year I am setting my goals higher and expecting even better things next year!" "Who would have ever thought how far coaching can take you in a given time. I've been training with Chris Helwig for almost a year now, and in that time I have seen a dramatic improvement in my cycling performance. Training on my own was tough, and with no real guidance I really didn't know how to achieve peak performance for my mid-season races. Together we set performance goals and developed a plan of smarter; more efficient training which eventually led me to three top 10 finishes and very close to a podium spot in Ontario Cup series racing." "In 2002 I had six top-ten finishes in sanctioned races, including two in Italy, I was in six winning breaks (one of which lapped the field) and I won a club race. In eight previous full seasons of racing, I had never once been in a winning break and I had never once won a club race. I achieved these results in my first year back after 5 years off the bike. I never felt fatigued, I never got sick of training and my desire to race was undiminished to the point where I didn't want the season to end. I also wasted zero time thinking about what to do for training and preparation for races. I attribute this entirely to the program prepared for me by Chris Helwig and my faithful execution of that program." "Chris is more than a coach — he is a coach/athlete. This translates into someone who, with his scholastic and practical experience, understands the day to day training and can give relevant and currently applicable advice. Chris’ broad knowledge of different sports and his work with athletes from every age group and level make him an excellent coach for anyone— no matter what your level of competition"